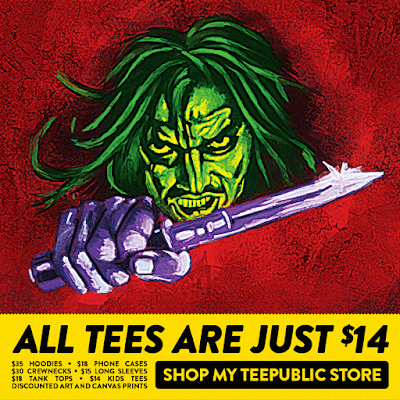 Hot on the heels of the announcement of my all-new Pre-Cert t-shirt I received an email from Teepublic informing me that starting today they're having a sale on all my designs. To commemorate this I decided to add three new designs exclusive to this sale: Vestron Video Yellow, Vestron Video Blue and Pre-Cert Red. The sale lasts until January 29th. Check it out here. 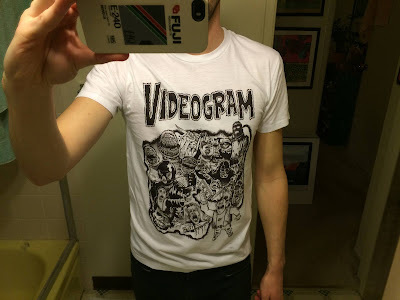 EDIT: Videogram tees in the wild! Check out Camera Viscera sporting the Lunchmeat VHS artwork by Loud Comix' head honcho Jamie Vayda! Many thanks for the support! Give them a like on Facebook here and check out Jamie's work here. An update on the David Bowie / Friday the 13th connection: Earlier this week Friday the 13th: The Franchise decided to run my tidbit of trivia regarding the Aladdin Sane LP showing up in Jason Lives: Friday the 13th Part 6. Read it here.